Dolphin & Konqueror do not support workgroups or domains with spaces in their name. I think this is a bug (as Windows can manage them), even if it's a bad practice to put spaces in workgroups names. Compiler: deb http://ppa.launchpad.net/kubuntu-ppa/backports/ubuntu jaunty main KDE 4.3.0 downloaded from that PPA. I'm in a office network of wich network's domain name was selected long time ago and it included spaces in it. Ej. "Office C.V.". Problem arises when you try to navigate the network using "smb://Office C.V." but you can actually see the Network if you just type "smb://". It seems that Konqueror (and Dolphin too) are unable to process the space in the Domain name and fails to open it. I've had problems mounting shares with spaces in fstab, but that can be worked around by using "\040" instead of the spaces. Konqueror & Dolphin says that "server can't be contacted". This is a big bug for me, as I have to do "smbtree" to find the individuals PC on the network and use "smb://<name>" to skip the domain issue. But when it comes to someone having spaces in his network's name... well, there I have to use fstab and the \040 trick. That is impractical to do, it's as impractical as telling everyone to change the domain name just because me. 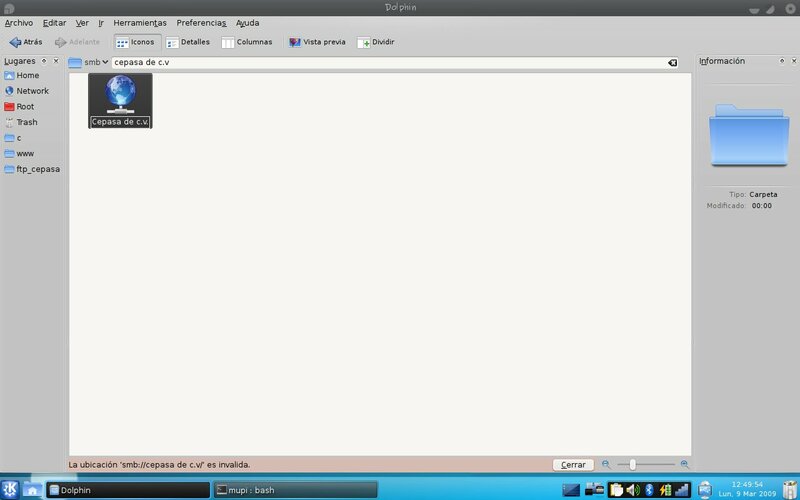 Well, system crashed and I decided to try Ubuntu, Nautilus does not suffer from this bug and so I don't think I'm going back to KDE while having this inconvenience. I think I'll not be able to test this anymore. Thanks for the upstream report.